CHC is fortunate to once again be a participating agency in the Highmark Walk for a Healthy Community: an event from which all monies raised go directly to support the good work of local non-profits. Supporting CHC in the Highmark Walk makes it possible for CHC to help people of all ages develop the skills necessary to face life's challenges. All money raised goes directly to CHC programs such as: bullying, drug/alcohol awareness, cyber choices, violence prevention and peer support. We ask that you join us in supporting this key fundraiser. Walk with us or donate - let's make 2017 our best year yet! Thank you to all the folks who made very generous donations to the Center for Humanistic Change prior to the Highmark Walk for a Healthy Community. It was a rainy day, but many people still came and walked. Donations are still being accepted until June 30. YOU can make a difference in the lives of your friends and neighbors in the Lehigh Valley area. 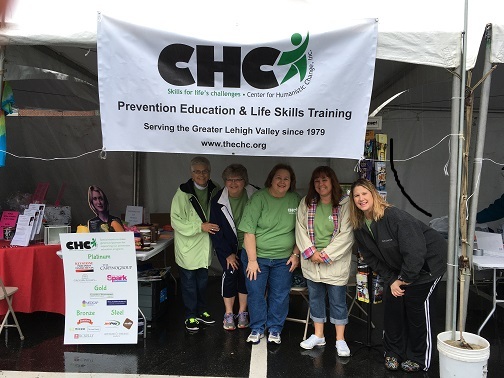 This year, 28 local non-profit organizations participated in the Lehigh Valley Highmark Walk. The total amount of money raised all goes BACK into the community to improve the health and well-being of everyone living in the area. It's amazing what a difference can be made when people work together!